Click on the skateboard, to customize! Made of the best quality hard-rock maple, this 8 1/8" competition shaped board has supreme pop, whether you’re doing grinds on the half-pipe or kickflips in the street! Also available in other sizes and styles. Beautiful illustration by Steven Daily makes this deck all the more special! 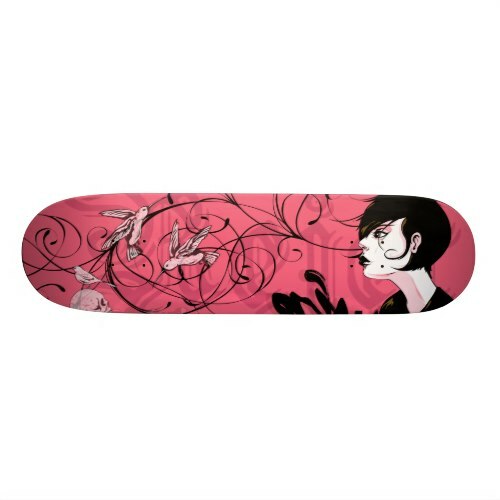 This is a completely customizable deck, you may add your initials, name, pseudonym, to the deck at no additional cost! Makes a great gift for you! Makes an awesome, cool, birthday or christmas gift, for friends, kids, and family, the people you love!